A study released last week by JAMA (Journal of the American Medical Association): Internal Medicine shows a direct correlation between gun laws and gun-related fatalities. While the study is mainly based on the number of gun laws, not the type (it doesn’t, for example, specify which particular laws are the most effective), it confirms that generally speaking, stricter gun laws result in fewer deaths. 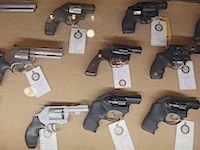 The report, entitled “Firearm Legislation and Firearm-Related Fatalities in the United States,” developed a method for rating states depending on the degree of the gun laws in place. How far state laws go to control gun trafficking, effectiveness of a background-check system, focus on child safety, restriction on military-style assault weapons, and whether state laws allow individuals to carry guns in public places were all considered when ranking each state. The states that come in at the top of the list for strong gun laws are Massachusetts, California, New Jersey, Connecticut and New York. Aside from California, which is closer to the median, these states also have the lowest average of firearms deaths per year. The states on the other end of the list—those with the most lenient gun laws—include Alaska, Kentucky, Louisiana, Oklahoma and Utah, all of which have among the highest percentage of deaths per year.